Q: Does Flaska contain BPA? 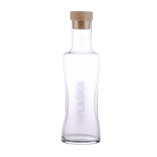 A: Flaska is made of glass and contains no BPA. 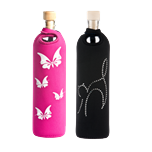 Glass is the best material for storing water as it does not leach any toxic substances. Q: Where is Flaska produced? A: Flaska is a Slovenian product. 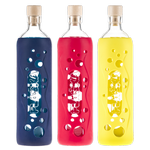 The glass bottles are produced in Italy while the final production phases (including programming) are carried out at Zgoša near Begunje in Slovenia. Q: Why is the neck of Flaska so narrow? A: The narrow neck is characteristic of Flaska to which we remain faithful because it ensures easier drinking. Q: What material is the bottle cap made of? A: The bottle cap is made of Expancork, which has obtained all the necessary certification for contact with food. 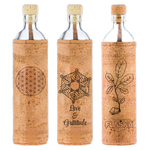 For Organic and Cork Flaska models, the bottle cap is made of natural cork. Q: What is water structuring? A: Water structuring, which happens inside Flaska, is the modifying of water’s vibrational structure to bring it closer to spring water. Read more about water structuring on http://www.flaska.ie/water-structuring. Q: What is glass programming? A: Glass programming is a process composed of four phases. The most important is the TPS phase (technology of programming silicone). Read more about glass programming on http://www.flaska.ie/water-structuring. Q: Which or what kind of information is stored in the glass? A: We use a programme consisting of various kinds of information from nature. This information is selected and harmonized with the aim of restoring the water’s original state. Q: Are you in possession of certificates which substantiate these assertions? Q: How long does it take for the water’s structure to change? A: The vibrational structuring of water begins immediately after the water is poured into Flaska – wait at least 5 minutes to ensure the full effect. Q: What is the seal engraved on the bottom of the bottle? A: The trademark on the bottom of the bottle, or cosmogram, has been designed specifically for Flaska by the Slovene geomancer Robi Lavin. The cosmogram protects the glass programme from malevolent influences. Q: Which external influences cause the weakening of the Flaska after four years? A: The influences of artificial and natural electromagnetic waves. Q: Is the structure of the water from the Flaska destroyed if we boil it? A: Energy-intensive processes, such as boiling, actually destroy the structure of the water from the Flaska. That is why we suggest making the tea first and then pouring it (but not boiling) into the Flaska. A: Do not wash Flaska in a dishwasher. Clean it using a regular bottle brush and kitchen detergents (if needed). We recommend using an eco-detergent. A: Pour into the bottle one part vinegar and two parts water. Leave overnight and the scale will decompose. A: It can. 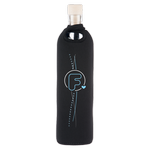 Here at Flaska company, we promote the consumption of water. However, Flaska can also be used to consume juices, tea etc. A: It is. The water vibrational structuring process never stops and the glass is robust and will not break. However, do not pour boiling water into Flaska. A: Because the Flaska bottle cap is in a form of a plug, the bottle is not suitable for fizzy drinks as the cap could be forced off the bottle. A: Send us a message at our contact page here or via private messages on Facebook (lookup "Flaska Ireland"). We will send you a new one free-of-charge. A: Every protective sleeve model is available in our online shop.